We have entered a new year with new hope for improvement in the world, in the lives of everyone. Over the last few decades we have seen erosion of faith and of respect for ourselves. There has increased a widespread ignorance of the truths regarding God and our relationship with Him. There is a contagion of doctrinal errors with sad consequences to souls: the lack of love and esteem to the Holy Eucharist, the neglect of Confession which is necessary for obtaining God’s forgiveness and for the formation of one’s conscience, the disregard for our supernatural last end, and a relegation of faith to private life with unrelenting efforts to strip it of all public expression. Marriage is deprived of its natural meaning and dignity. Laws permissive of abortion betray a far greater appreciation for material ease over the value of human life. A decrease in the birthrate and an aging population are leading to the end of the cultures in many European countries as well as our own. On top of all of this, there is often hostility to the Catholic Church. This is the result of a diminishing of spiritual life. As people become more and more material, they become more and more soulless. The world becomes less human as it ceases to be Christian. Although there is such extensive ignorance of God, He is present everywhere. He does not force any one to recognize Him. He loves each person unconditionally even if that person gives Him no attention whatsoever. It is unfortunate that so many individuals miss out on knowing God and all the truths of our Faith. There would be true joy if they let Him into their lives. It is really up to us to help the world open up to God. We should be especially aware of this now that we are in this Year of Faith. Perhaps we can promise to make an effort to do the following on this feast of the Epiphany. Prayer is essential because it is powerful. Let us pray for everyone. Because Our Lady is so significant in our relationship with her Son, let us commend the world to her for her powerful intercession. Let us also be of good example; we should live our faith happily. We ought to show proudly the signs of our Faith: the scapular, the crucifix, blessings at meals, images of Our Lord, Our Lady and the Saints in our homes and places of work. 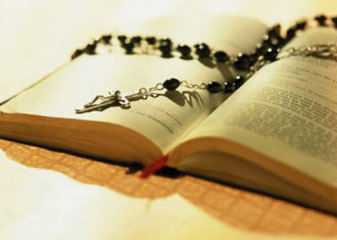 It is also necessary to be ready to explain the truths of Catholicism when challenged or when asked. This means that each of us should know it ourselves. Understanding the catechism is easily accomplished not only by reading The Catechism of the Catholic Church, but also by watching EWTN on television, or by going online to ewtn.org, or to vatican.va/. May each of us do what God wants of us to evangelize. Doing so is an act of love not just for God but also for others.